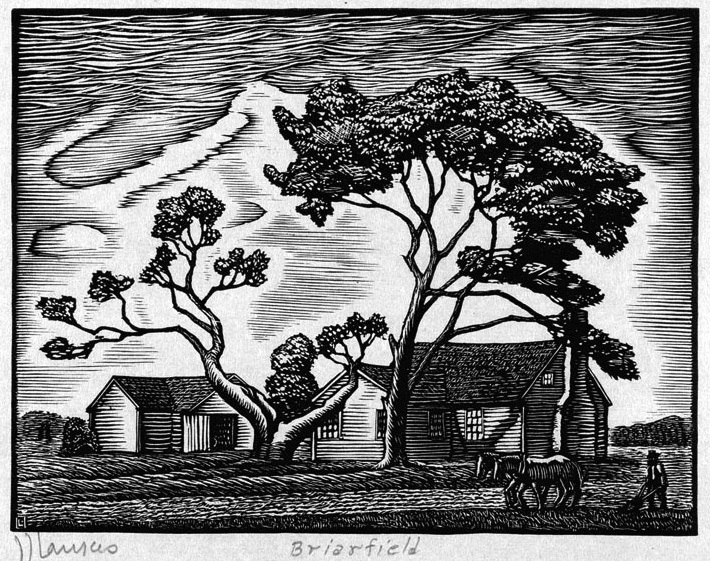 Charles F. Quest (USA, 1904-1993) said that he found woodcuts “more enjoyable than any other means of expression.” So he gets points for that! Although he did some figures and some quite abstract pieces, Quest’s special subject is still lifes, which is, on the whole, not the most common subject for block printing. 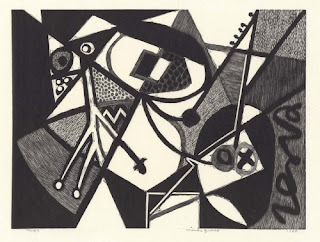 Specifically, he experimented a lot with still lifes with mechanical elements, such as tools or machinery, and in a very “modern,” abstract style. This first one is very typical of his work, with lots of different variations of small straight lines making different tones and textures in flat, geometric areas. Plus I’m amused by the title, “Still Life with Vise.” I like to imagine that someone told Quest, “You should do a traditional still life. You know, with a vase arranged on a table…” but he misheard. Now, as any Scrabble player will be quick to tell you, there actually are some English words that have Q without U, but these are almost all borrowings, and often questionably English. Those words that have been thoroughly adopted into English often have a more common non-Q spelling, such as faqir (fakir), burqa (burka), qabalah (kabbalah), qi (chi), and sheqel (shekel). Others are really still foreign words, even when they appear in English, such as qaf (the 21st letter of the Arabic alphabet), qawwali (devotional music of the Sufis), qindar (Albanian currency), and qiviut (musk-ox wool). The only u-less Q words of English origin are of recent invention, such as qwerty, for the letters of the standard typing keyboard. Perhaps the most ridiculous word on the list of Q’s without U’s is qhythsontyd, an obsolete Scottish spelling of “Whitsuntide”, which I don’t believe really belongs in a list of modern English at all! Ridiculousness is the segue to my last point. Even with Norman spellings of native English words and plenty of borrowings from other languages, Q remains the second least common letter in English (after z), and that tends to make Q words sound intrinsically goofy. Yes, words like quick and quiet are perfectly normal, but consider quack, quaff, quark, quaver, queasy, quibble, quinquennial, and quirk. Don’t they seem a little sillier and more fun than your average word? 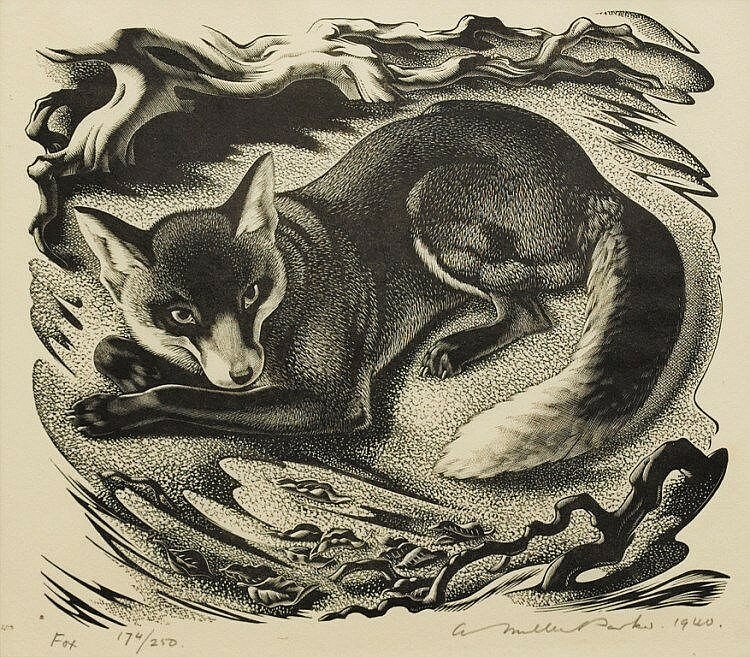 Agnes Miller Parker (UK, 1895-1980) was most known as an illustrator and did wood engravings in that style of very fine, precisely controlled stippling and cross-hatching. On the whole, this style tends to be too smooth for my taste - I like a little more carviness - but it’s certainly interesting for variety. 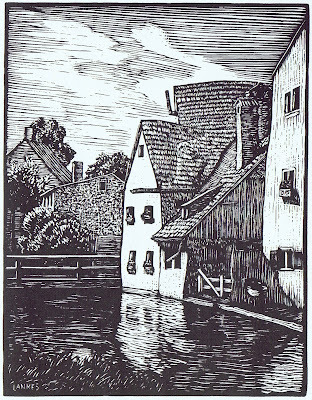 She’s also important for being one of the artists who helped bring about a revival in the use of relief block printing for book illustration in the early twentieth century, after it had gone out of fashion with the invention of other methods of reproduction in the second half of the nineteenth century. My favorites of Parker’s work are definitely her animals. They combine a detailed naturalism with the stylized sleekness of the modern art movements of the mid twentieth century. The backgrounds are often just a suggestion of forest or meadow while the animals themselves are detailed to the last whisker. 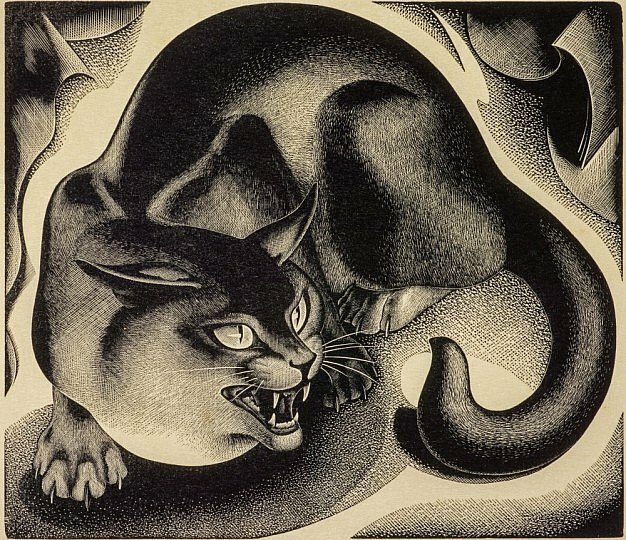 Parker obviously loved portraying the lithe movement and flexibility of animals, especially cats, a subject she returned to over and over. rather than adapting from the strengths of color. 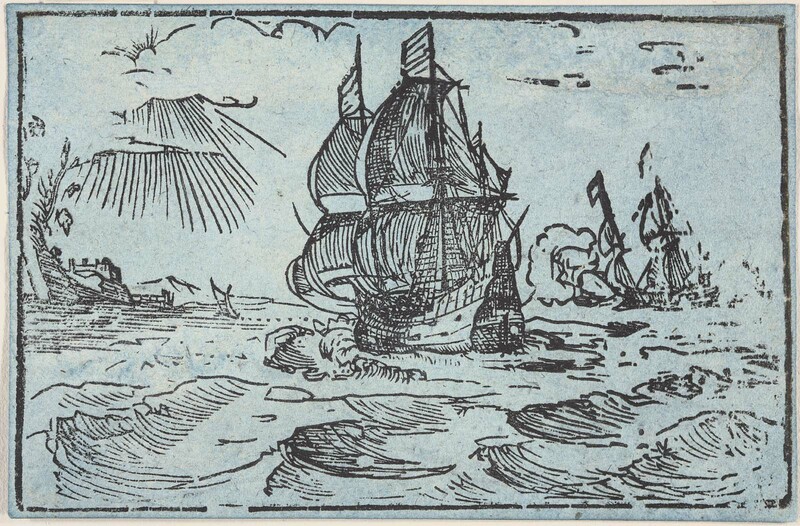 But maybe this is why I don’t tend to be as attracted to the wood engravings with gradations of tone too fine and smooth. At any rate, however, Parker’s animals are pretty cool. I hope you enjoy them. The sheer amount of carving in the first piece is quite amazing. First of all, there’s that writing, going all the way around the border. Then there’s the little leaves filling half the block - and black leaves on white take a lot more carving than white leaves on black. And finally the bricks. Unfortunately I can’t make out sharp detail on these on-line photos, but it looks like white bricks and black mortar, which, again, is one of the hardest, most fiddly patterns to carve. 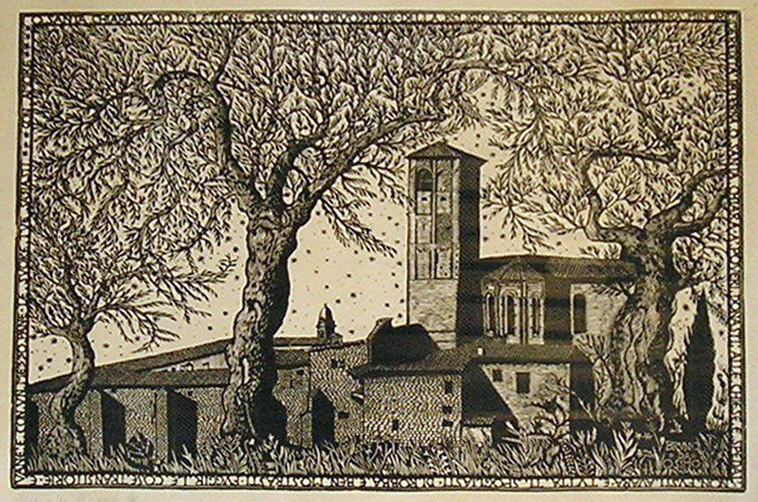 The level of detail on the second piece is also pretty crazy, but perhaps the most interesting thing is Osimo’s choice to depict the building with the strong shadow falling right across it. You’d think he might take a little artistic license and ignore the shadow in the interests of showing the building more clearly, particularly when it’s the sole focus of the piece rather than being part of a whole cityscape. 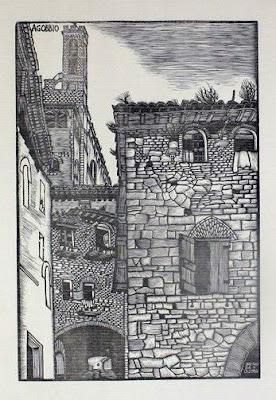 But whether he was working from a photograph or his own plein air sketches, he’s obviously chosen to depict this building with maximum realism. The third piece is my favorite. The carving is beautiful, the composition is interesting, and the scene really captures my imagination. Somewhat to my surprise, I don’t seem to have any previously-featured artists that begin with the letter O. That seems hard to believe, but there it is! Emil Nolde (German/Danish, 1867-1956) was an expressionist painter known for his exploration of color. So what’s he doing here in a blog called “Black and White”? 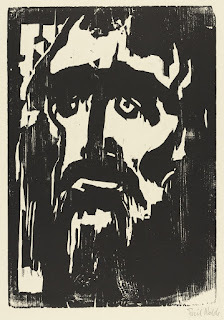 Well, he did woodcuts, too, in that rough expressionist style. 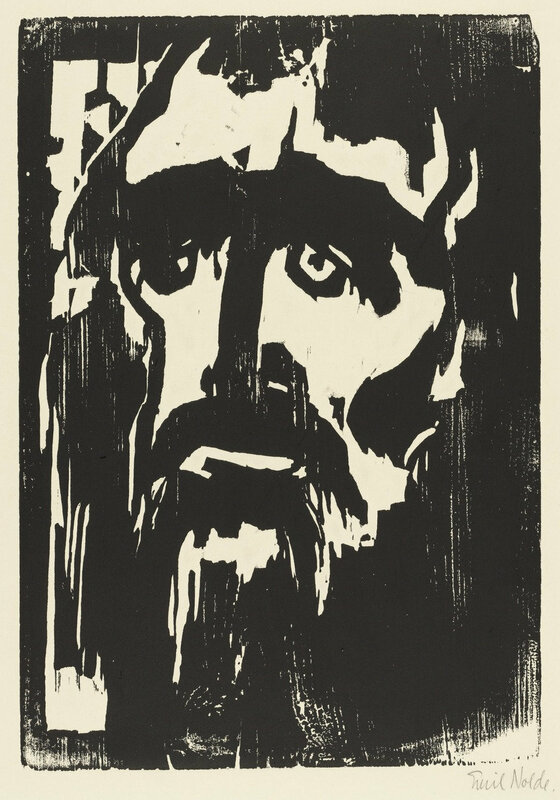 The first one here is the most famous, in which the haggard face looms up out of the rough wood with an expression of intense… I was going to say “anguish,” but maybe “disappointment” is more accurate, even if it doesn’t sound as dramatic. The rough woodcarving works perfectly for the hollow eyes and gaunt features. This fishing boat is also “haggard,” if that adjective can be applied to something inanimate. 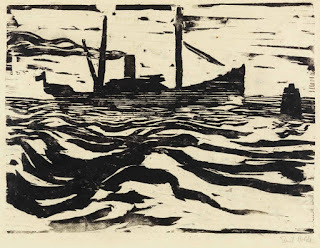 It’s interesting for the visible wood grain along the hull, implying the wood block Nolde used was a pretty rough plank, rather than the very fine plywood that’s often used by artists. Also, notice how imperfect the inking is, especially around the bottom and edges. I reject my own impressions that have inking like this, but it’s consistent with the expressionists’ emphasis on trying to convey emotion and immediate personal experience. 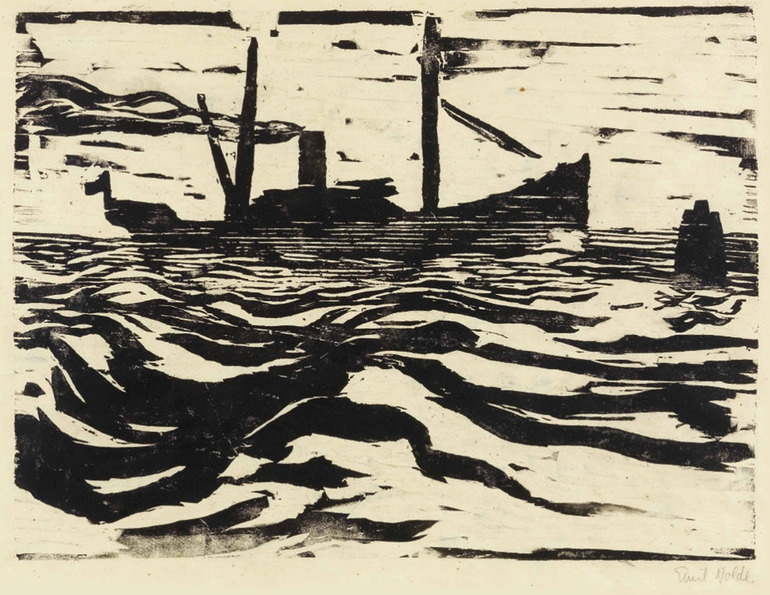 Generally I don’t much like Nolde’s people, with the exception of the prophet above, so it’s fun to discover his boats, which I do enjoy. On a biographical note, Nolde was a Nazi supporter, and even after his work was labelled “degenerate” and he was banned from painting, he continued to plead his loyalty and support of the regime, while painting watercolors in secret. 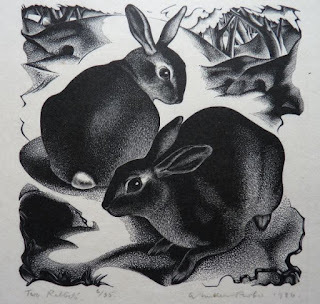 After World War II, the Nazi’s rejection of his art was taken as sufficient evidence for his rejection of the Nazis, and he was reinstated to much success and acclaim. From a justice perspective this seems really weak, but I guess from an art perspective it’s good that he was able to create more work. In any case, the pieces I have here today are all earlier. 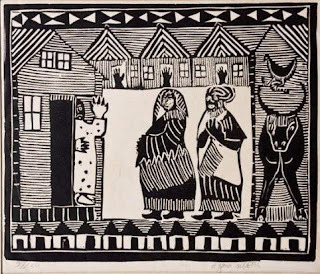 Azaria Mbatha (South Africa, 1941-) is considered a major figure in the development of modern South African printmaking, although he’s lived most of his adult life in Sweden. 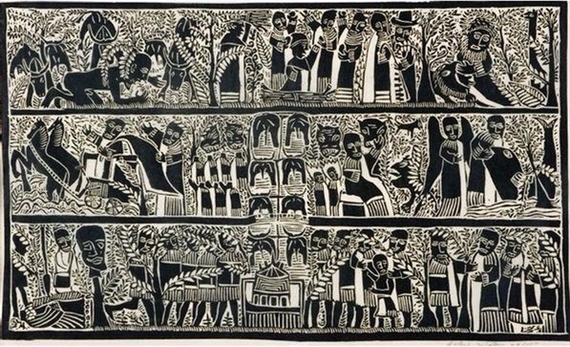 His large linoleum block prints typically are narrative scenes, most frequently with Biblical themes, which he tries to depict in uniquely African ways. 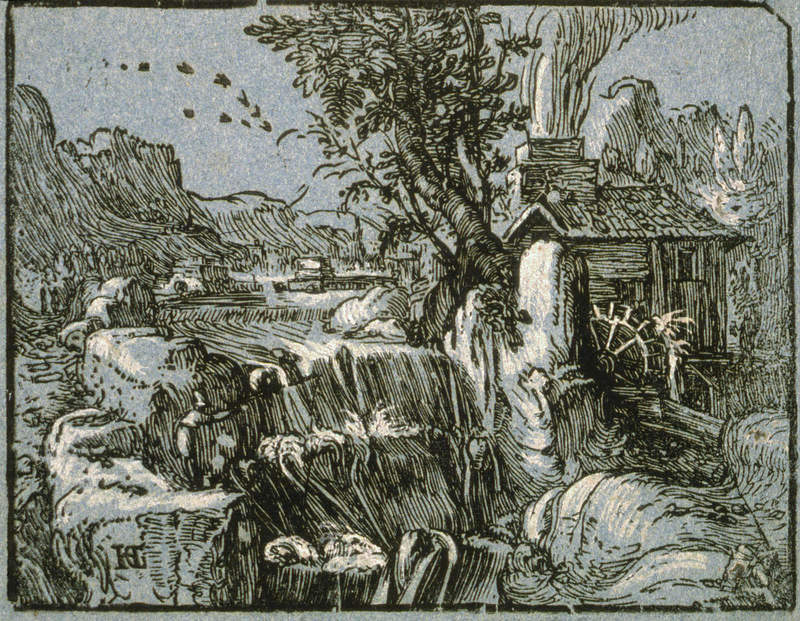 His compositions often include a series of panels, like a page from a graphic novel. They’re always busy, full of patterns, action, and rhythm. 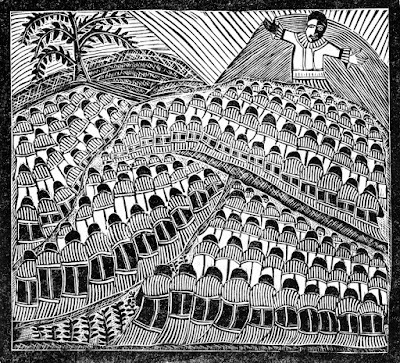 I love the swooping lines of this first one, in which the crowds of people form the very hills. There’s an interesting use of black and white in the face and hands of the speaker, and I like the contrast of the tree and plants adding a little organic relief to all that repetition. 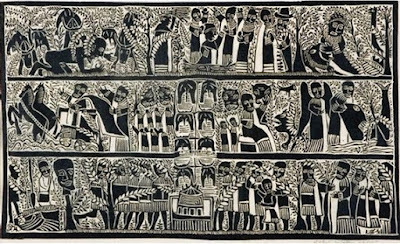 Here also is one of Mbatha’s pieces with separate panels, in this case, three tiers of action scrolling through various Old Testament stories. His people are not distinctive; they’re clearly more symbolic than individualistic. Their faces are mask-like. I love how the entire background is full of leaves so that no space is left blank. 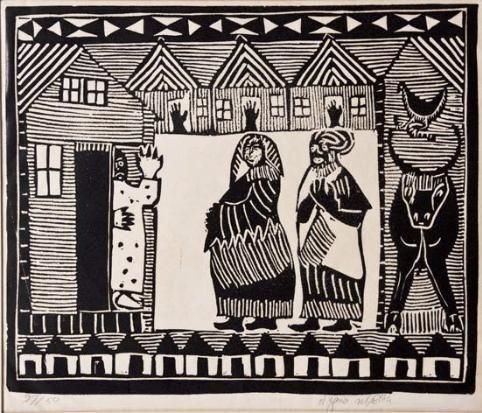 And here’s also a simpler piece, entitled “No Room at the Inn.” I like the upraised hands blocking each of the doorways in the background, and the row of black-doored houses framing the picture across the bottom, echoing the shapes of the more abstract border across the top. I like how Mary actually looks really pregnant, and I like the chicken waiting in the barn behind. 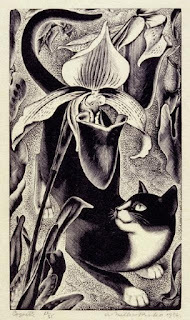 Here are some really gorgeous pieces by J.J. Lankes (USA, 1884-1960). In fact, I’ve had a hard time limiting myself to just a few. Lankes has a very characteristic style, with lots of views of landscapes, trees, and old buildings, lots of clouds and skies, and the romance of a fading rural culture. He has a trick of giving things a sort of reverse shadow, a glow of carved out white along them that contrasts with his skies, which are often quite dark with shading lines. He also has lots of fine pattern and texture: grass, bricks, shingles, and stone. The first piece here is the most typical of Lankes’s work. Nothing too exciting, you might think, but he takes a fairly unremarkable scene and gives it a quiet nobility. 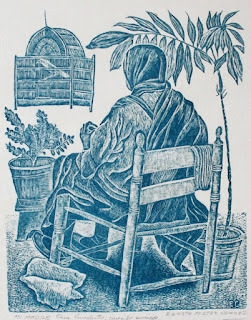 He always seems to respect his subjects, and that’s exactly one of the things I like best about relief block printing: to make an image of something is to proclaim its value. The top of the sky in the first piece looks very like water, which is interesting. In the third one the sky is pretty regular in the open spaces, but all mixed up in a scribbly way with the spaces between the tree branches. 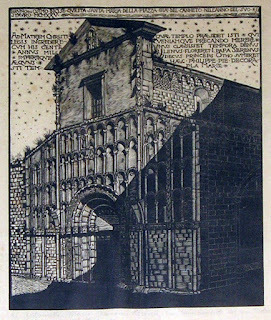 I love the looser, less controlled carving there, contrasted with the very precise details of the building and wall. 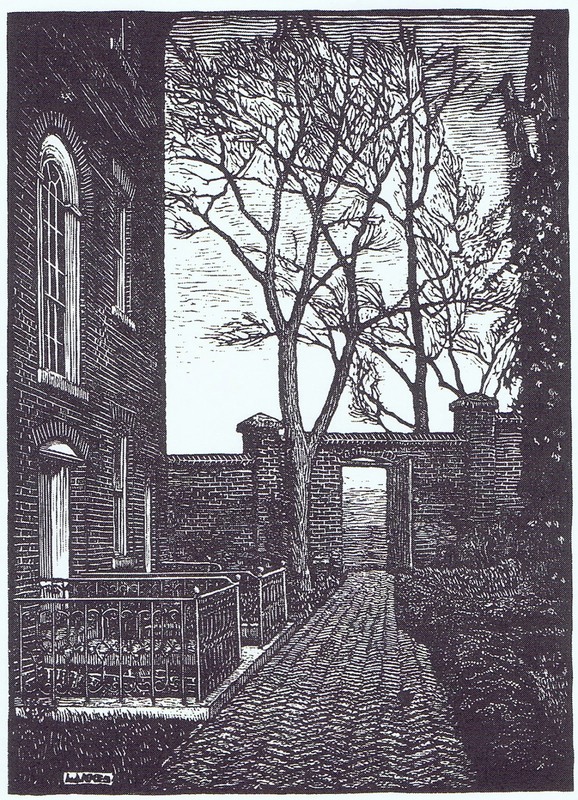 The suggestion of the wrought iron railing is masterful; I am in awe of how Lankes decided where to make white lines, and where to leave black to get the effect so perfect. 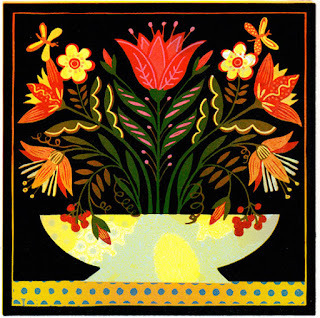 Lankes is another of those artists that I think deserves to be much better known. You may be seeing more of him here in the future! František Kupka (Czech, 1871-1957) was a painter during that wild and crazy artistic period when romantic realism was giving way to a roiling ferment of Art Nouveau, Futurism, Cubism, color theory, and a new art -ism every year. 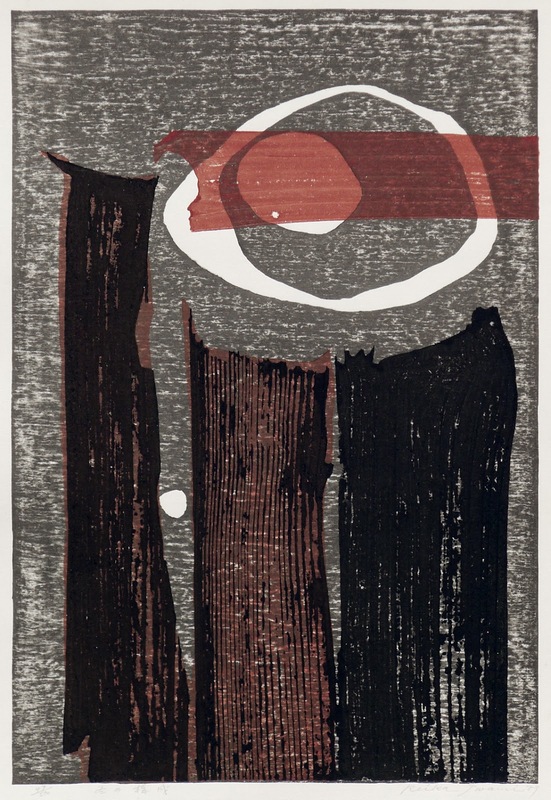 He became one of the first of the European artists to produce purely abstract work, and I have for you today a couple examples of his abstract wood block prints. 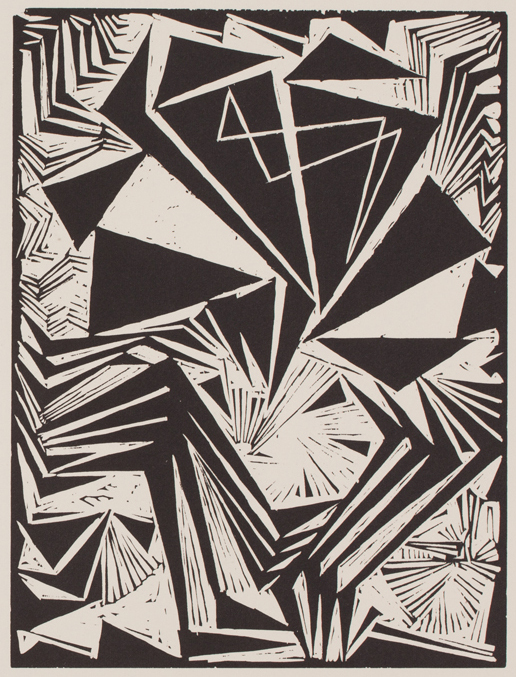 Printmaking was an unusual medium for Kupka, but he chose it for a series of 26 pieces entitled “Four Stories in Black and White” (or “Four Stories of White and Black,” depending on the translation.) The “stories” are essentially visual themes and variations, in which Kupka developed his theories about abstraction. I really like the contrast of solid white, solid black, and pattern in the first one here, which is my favorite of the whole series, I think. 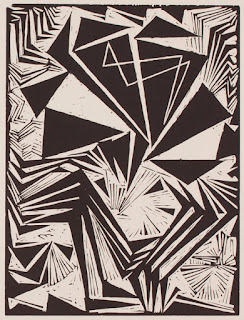 The second piece evokes something of dynamism, as if the triangles are flying around and ricocheting off the edges of the block. 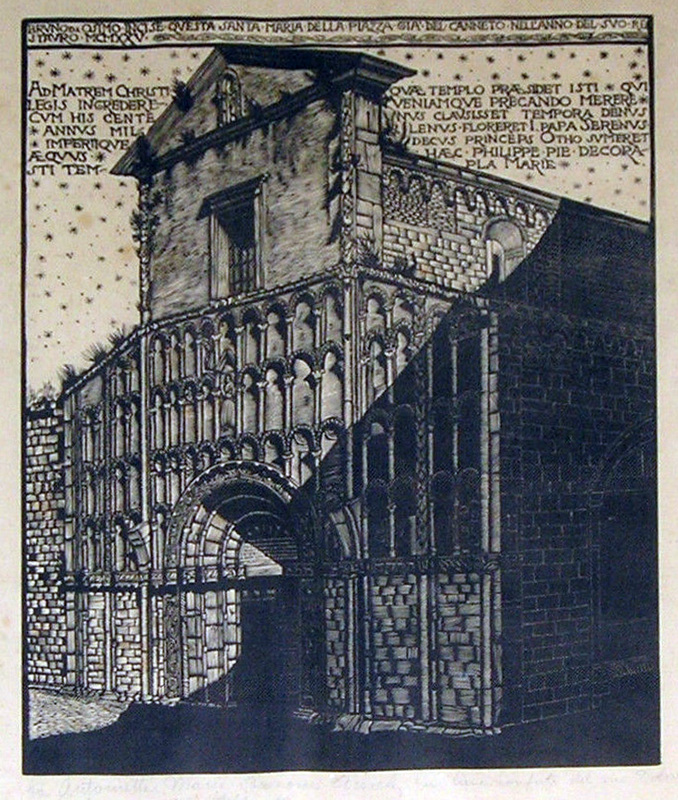 I don’t expect ever to become a convert to the church of abstraction, but I do like some of Kupka’s work very much. 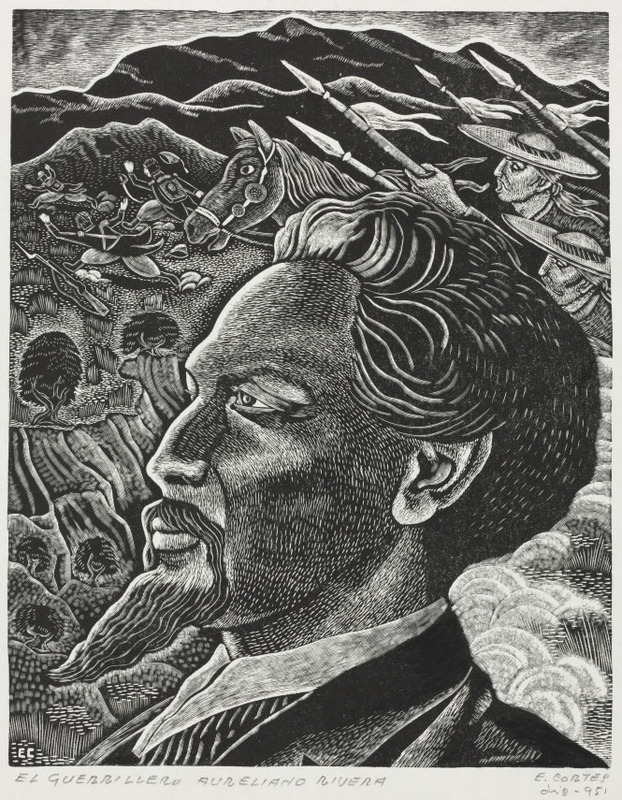 Erasto Cortés Juárez (Mexico, 1900-1972) like many of the Mexican printmakers of the twentieth century, did a lot of political art, including portraits of many of his political heroes. This first piece is particularly polished and detailed. It’s got an interesting composition in which scenes or symbols from the subject’s life blend with the landscape background. I like the beautiful shading of his face, and how the use of the multi-line engraving tool in the collar and lower right give a softer look than is usual in woodcuts. As always, however, I prefer pieces that are more universal than political art can be. This portrait of the artist’s mother is unusual and interesting for showing her from the back so that we can’t see her face. She seems to be watching the caged bird and isn’t doing anything else but simply sitting quietly. 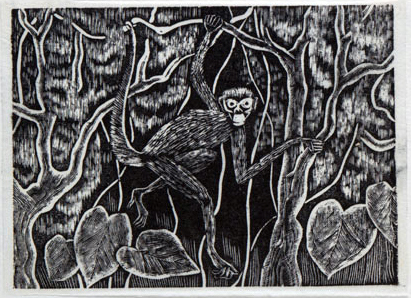 I was especially pleased to find a collection of animals, always a favorite subject of mine. Isn’t the monkey fun? By the way, if you’re here through the A-Z Blog Challenge, this is the post where the bloggers following the proper schedule catch up with my modified schedule. From here on my letters will fall behind the official A-Z Challenge calendar. Don’t worry, I’ll still post every letter of my alphabet, and I’ll still link my posts to the correct letters; I’ll just be doing it a little late. 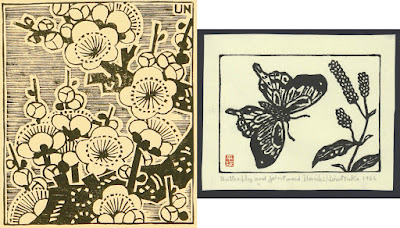 Please keep dropping by this blog to discover my remaining block print artists. 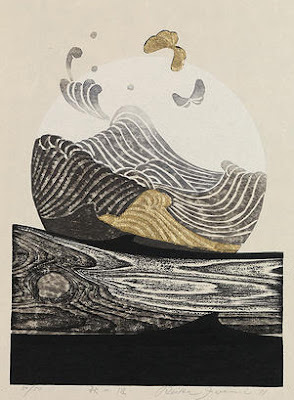 Reika Iwami (Japan, 1927 - ) is an extremely rare creature: a successful woman in the male-dominated world of Japanese printmaking. She was inspired by the sôsaku hanga movement (including Hiratsuka) in the 1950s, but she has a completely distinctive style of her own. Her work is quite abstract, but evokes elements of water, mountains, moon, and other natural forms. 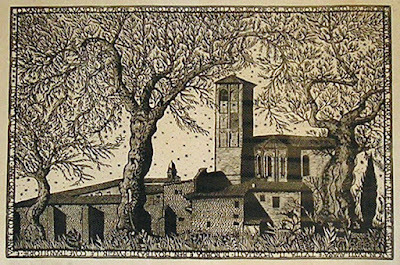 Although she works with wood blocks, she also combines it with techniques of collagraph. She also uses metallic ink and embossing to add texture to her work. 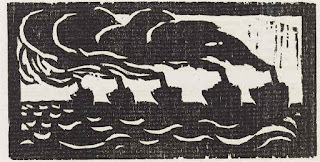 The second piece is Iwami’s break-out hit, published in The Modern Japanese Print - An Appreciation compiled by James Michener in 1959. 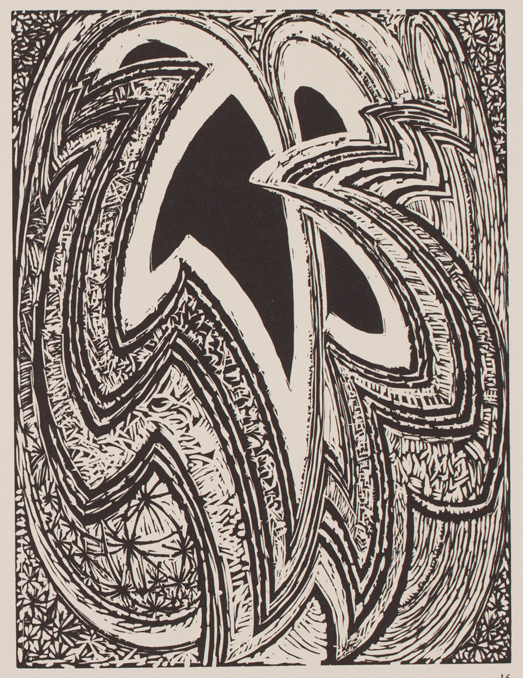 This collection of prints was instrumental in bringing recognition and success to the ten artists it featured. I have to confess that I don’t particularly care for Iwami’s work, but variety is the spice of life and it’s fun to feature something different on occasion. 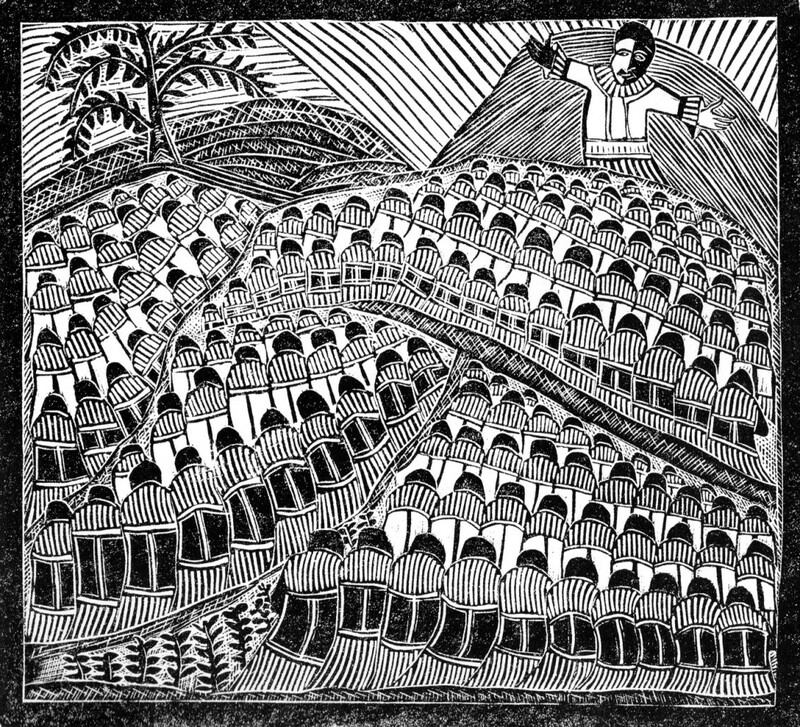 The relatively few printmakers beginning with the letter I makes a great opportunity to pick someone I wouldn’t otherwise have looked at. And speaking of the scarcity of I printmakers, it looks like I’ve featured only one before! 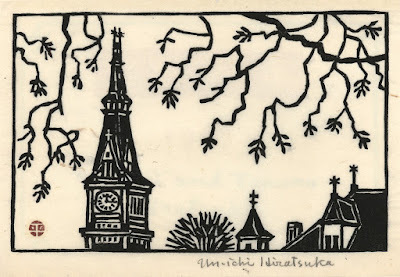 Un-ichi Hiratsuka (Japan, 1895-1997, long life!) 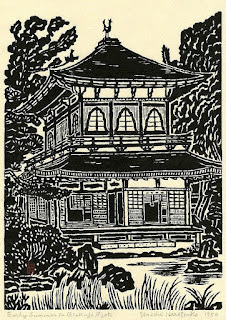 was one of the leaders of the Japanese sôsaku hanga movement in the early twentieth century, in which artists draw, carve, and print their works themselves, instead of the traditional system in which each of these steps is done by different craftsmen. 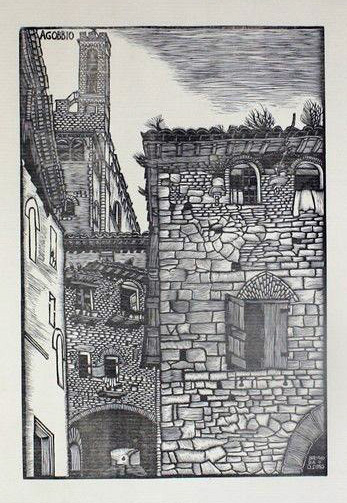 I like a lot of Hiratsuka’s work, but I particularly like the architectural pieces. We’ll start with a traditional Japanese scene, with traditional Japanese architecture and lots of detail. I love the geometry of the building contrasted with the freer carving of the natural features. 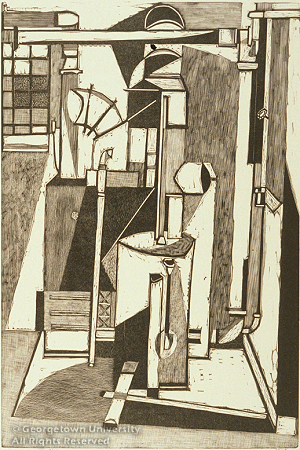 Then for variety I’ve also got one of Hiratsuka’s American scenes, with an interesting composition. I absolutely love this one, with its combination of architectural geometry and organic branches, and its hand-carved roughness creating fine details. 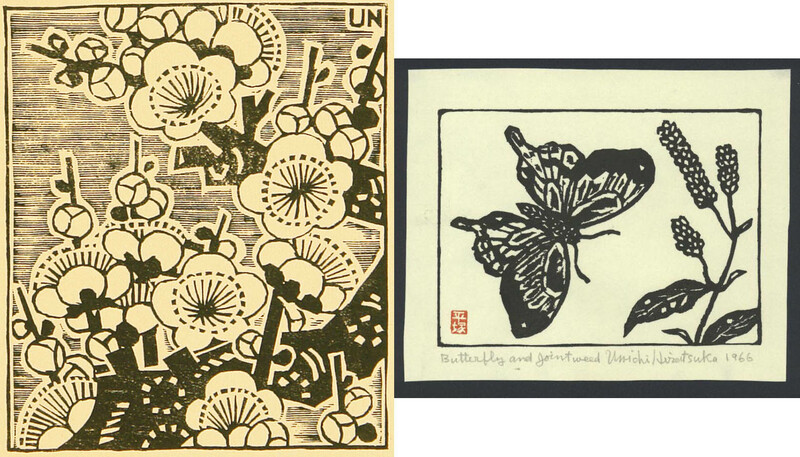 I also couldn’t resist including two little botanical pieces, one early and one later, with very different styles. The first is very graphic and geometric, with a textured background filling the space. The second is more delicate and realistic, with plenty of empty white. 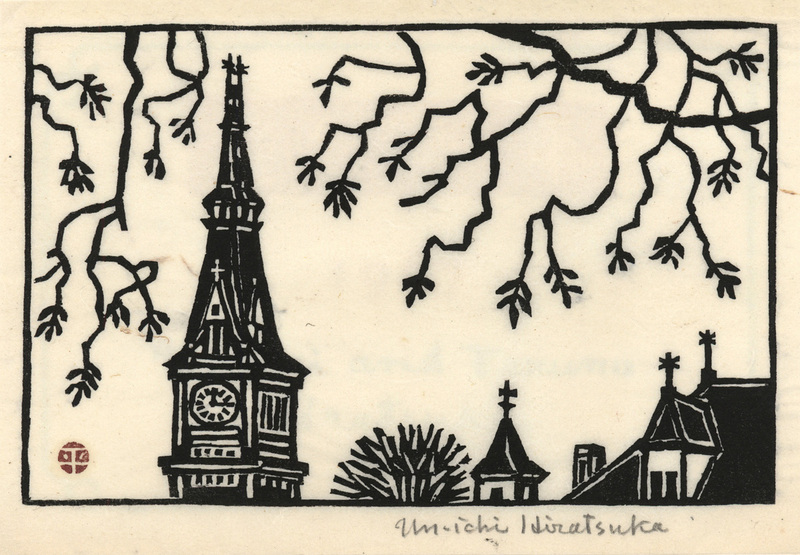 Over such a long lifetime, it’s not surprising that Hiratsuka should have worked in a variety of styles. I really like these both. Technically I’ve already featured a piece by Hendrick Goltzius (Netherlands, 1558-1617). But I’m trying to make sure this alphabet of printmakers covers a bit of diversity, and my other G options were all in those same early 20th or 21st century time frames. So I’ll share them some other time, and today you get a bit more of an Old Master. 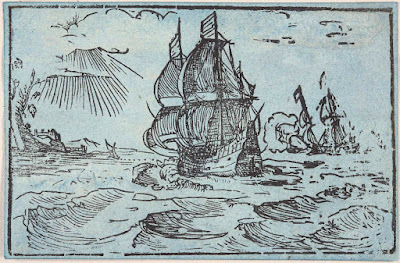 with line for which Goltzius was famous - his lines look quite loose and natural, almost like brush and ink, but with just enough look of carving to keep me happy. One other trivia note about Goltzius: his right hand was deformed from a childhood accident, but it happened to be deformed in just the right way that it worked well for holding engraving tools. I admire Goltzius for turning a negative circumstance into something that worked for him. Let’s take a break from the first half of the twentieth century and visit the contemporary work of Linda M Farquharson (UK, 1963-). These are linoleum block prints, with all the flat, smooth control linoleum makes possible. 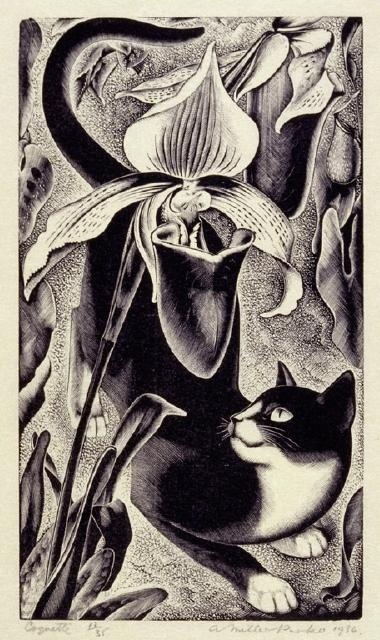 Farquharson does lots of flowers, birds, and animals, which I enjoy very much. She also does both black and white and color designs, and I find her color choices very rich and beautiful. 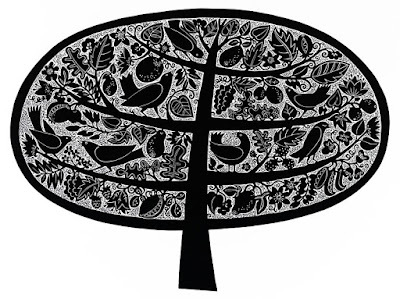 I especially like this tree of life, a symbol that’s always been meaningful for me. 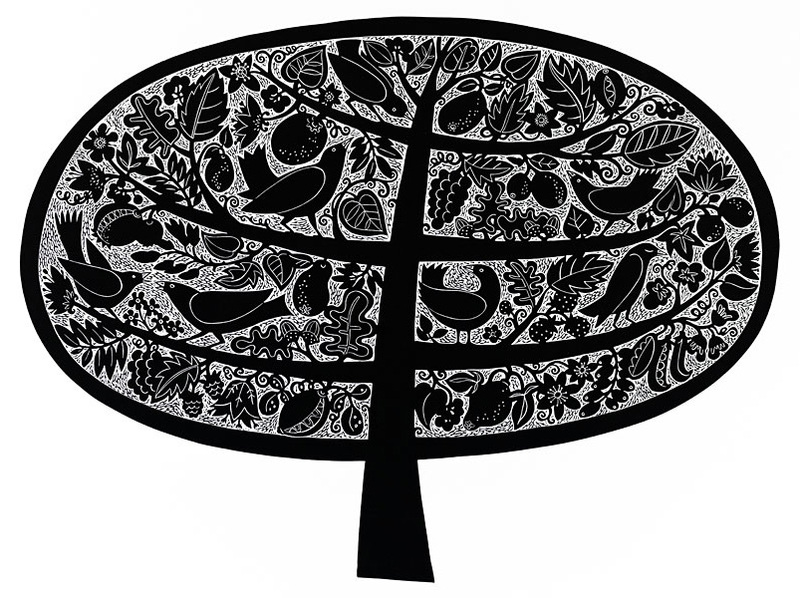 I like the contrast between the very simple, stylized design of the tree, and all the exuberant details. Notice the variety of leaves and fruits and flowers: grapes, acorns, lemons, peas, strawberries, pomegranates… The birds, on the other hand, are all much more similar. I like how the background space within the tree is filled with an even speckled pattern. And here’s a wonderfully vibrant color print. 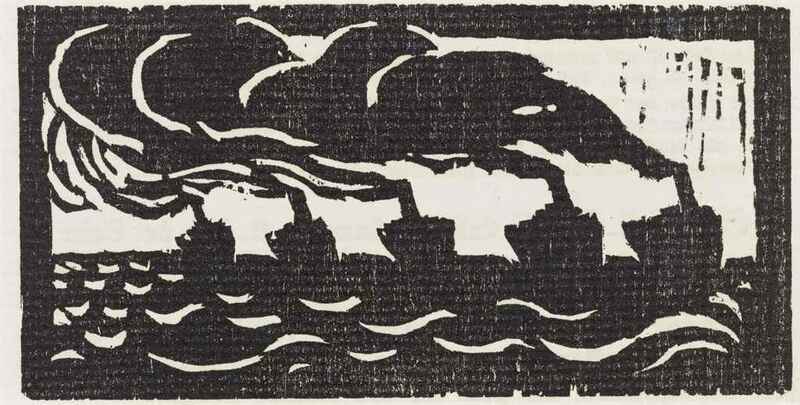 It’s a reduction print, so it’s interesting to try to figure out Farquharson’s different levels of carving and ink. 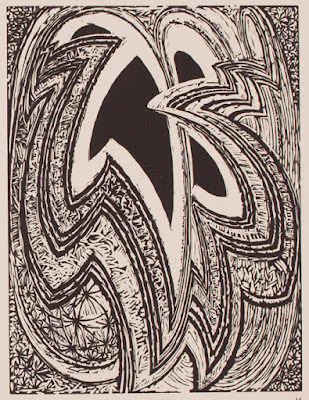 Or on the other hand, if you’re not a printmaker yourself, don’t try to figure it out, just sit back and enjoy it.